This concept is something that was initially developed with Greg Althaus, my colleague at Dell and then further refined in discussions with by our broader team. It grew from my frustration with the widely referenced predictions by the Gartner Group of a private cloud explosion. Their prognostication did not ring true to me because the economics of “public cloud” are so compelling that going private seems to be like fighting your way out of a black hole. We’ll get to the gravity well (post 3 of 3) in due time. For now, we need to look into the all knowing magic 8 cube. Our breakthrough was seeing cloud hosting as a 3 dimensional problem. We realized that we could cover all the practical cloud scenarios with these 8 cases. Showing in the picture (right). X: Hosted vs. On-site – where are the servers running? On-site means that they are running at your facility or in a co-lo cage that is basically an extended extraterritorial boundary of your company. Y: Shared vs. Dedicated – are other people mixing with your solution? Shared means that your bytes are secretly nuzzling up to someone else’s bytes because you’re using a multi-tenant infrastructure. Z: Managed vs. Unmanaged – do you’re Ops people (if you have any) able to access the infrastructure that runs your applications? Unmanaged means that you’re responsible for keeping the system operating. With 3 axis, we have a 8 point cube. MSH – a PaaS offering in which every aspect of your application is managed and controlled. GAE or Heroku. MSO – remember when people used to buy a mainframe and them lease off-hours extra cycles back to kids like Bill Gates? That’s pretty much what this model means. MDH – a “mini-cloud” run by a cloud provider by dedicated to just one customer. Dr. Evil thinks this costs one milllllllllion dollars. MDO – a cloud appliance. You install the hardware but someone else does all the management for you. USH – IaaS. I think that Amazon EC2 is providing USH. It may be a service, but you’ve got to do a lot of Ops work to make your application successful. USO – OpenStack or other open source cloud DYI frameworks let a hosting provider create a shared, hosted model if they have the Ops chops to run it. 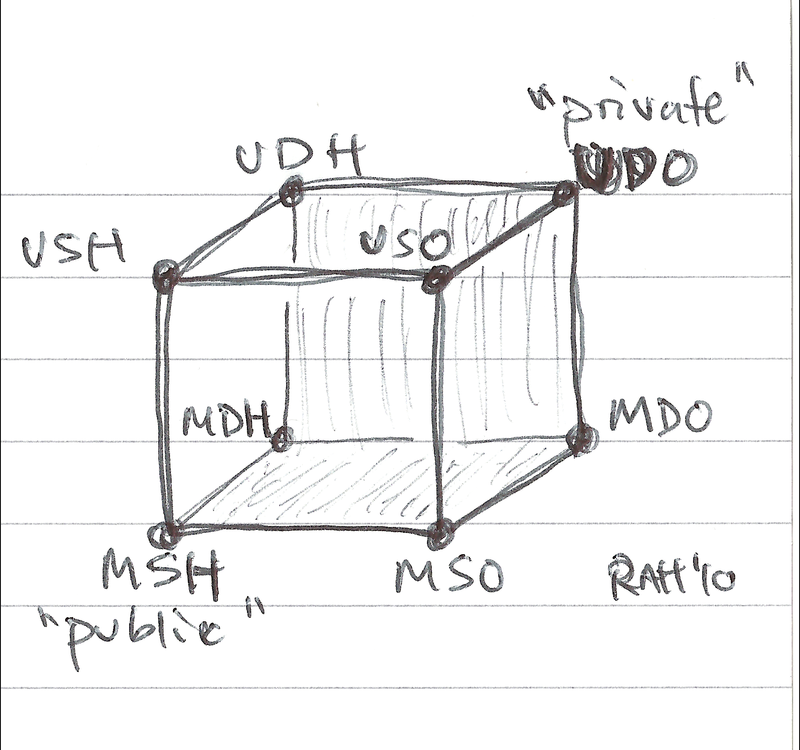 UDO – The mythical “private cloud.” Mine, mine, all mine. In thinking this over, we realized that cloud customers were not likely to jump randomly around this cube. If they were using MSH then they may want to consider MDH or MSO. It seemed unlikely that they would go directly from MSH to UDO as Mr. Bittman suggests; however, the market is clearly willing to move directly from UDO to MSH. We had a good old-fashioned mystery on our hands… the answer will have to wait until my next post. This entry was posted in Architecture, Clouds, Economics and tagged axis, cloud, gartner, Greg Althaus, magic 8 ball, tom bittman by Rob H. Bookmark the permalink. Thanks. I’m thinking to add some video posts and it’s time to upgrade to a pro theme. I’ve sort of made it a thing to use my own photos – stock is cleaner but not as original. Did not know this had posted there. Can you give me the link?